STORY — West Fork Whiskey Co.
Spring Mill was built by Thomas and Cuthbert Bullitt, starting in May of 1817 and completed only six months later. They bought the park from Sam Jackson, who acquired the land for his service in the War of 1812, and the Bullitts sold the village to the Montgomery brothers for $20,000 in 1823. But after their deaths, a son sold it to Hugh and Thomas Hamer in 1825 for $7,000, to be paid over time. In the 19th century, some called it the finest whiskey around. We still call it that. For years, the Hamer Family operated a mill in Lawrence County, IN, distilling excess corn and selling it to whiskey lovers as far south as New Orleans. Once lost in the sands of time, Old Hamer is ready to enjoy again. The goal of West Fork Whiskey has always been to create great Indiana whiskey. 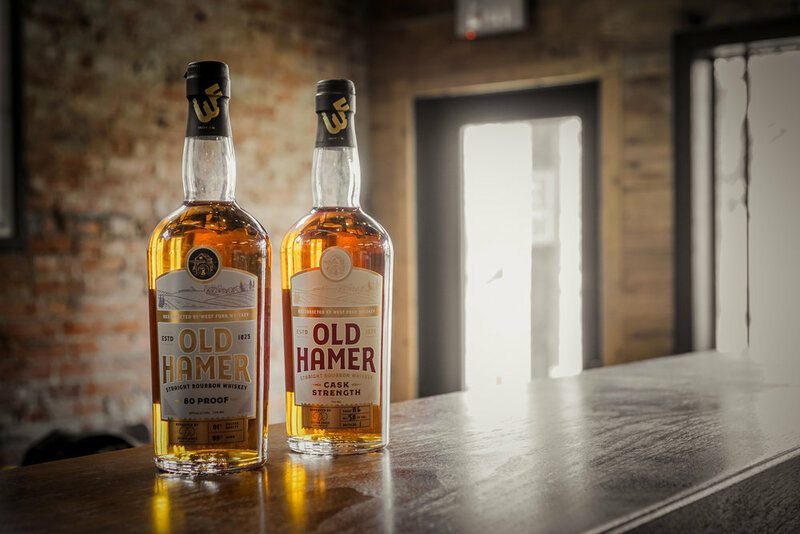 We decided to resurrect the Old Hamer brand as it has a unique place in the history books of whiskey in this great state. Its mash bill of 99 percent corn and 1 percent malted barley is very similar, if not identical, to that of what the Hamer family would have used while creating their whiskey. We feel this brand is an accurate representation of great Indiana whiskey.